Richardson is testifying in the Baptist sense of the word and her remarks are greeted with various interjections of “yes” and “that’s right” from the 30 or so people assembled on the steps of City Hall. “The fight we are fighting here today is everybody’s fight,” she continues. It’s through battles like this one, over the future of the Bedford -Union Armory in Crown Heights — taking place far from the pages of the New York Times yet central, nonetheless, to the future of the city — that this once obscure socialist group is building a base of supporters and allies. DSA membership grew steadily last spring when the Democratic primary campaign kicked into high gear, thanks to the organization’s involvement in Bernie Sanders’ presidential run, and has since tripled following the election of Donald Trump in November. The group now boasts more than 19,000 members nationwide making it, by far, the largest socialist organization in America. It is a “Honey, I blew up the left,” situation. The DSA is helping to funnel thousands of people, many of them millennials into grassroots social justice campaigns across the country. “I joined right after Trump got elected,” said Jabari Brisport, who was among the DSA members on hand for the press conference. Brisport has been an activist for years — going to marches, performing political theatre — but he started attending DSA meetings in November and began paying dues to the group a couple of months ago. Brisport is a third-generation resident of Prospect Heights, which neighbors Crown Heights. He witnessed gentrification as it forced many longterm residents out of his native neighborhood and doesn’t want to see it happen again. While the DSA’s explosive growth is unprecedented in recent history, there’s also a case to be made that activists like Brisport are carrying on a longstanding socialist tradition in New York City. 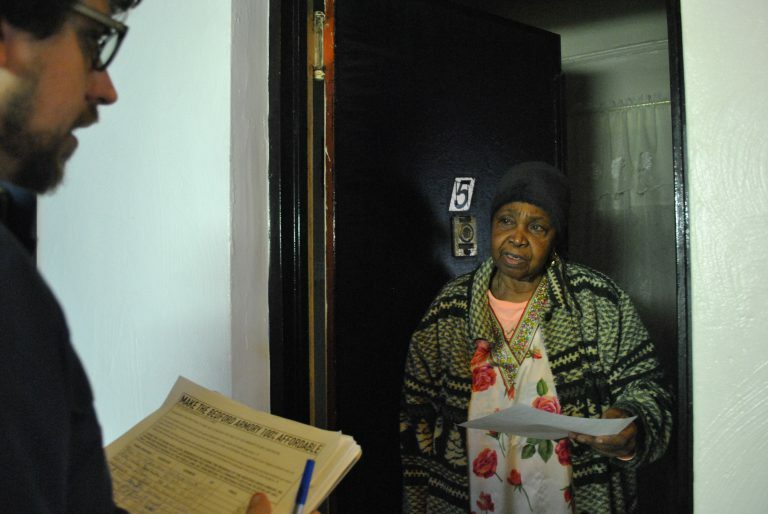 Rent strikes and eviction defenses led by militant tenant activists helped win some of the most progressive renters’ protections on the books in New York today. Reds were also early pioneers of the civil rights movement forcing department stores in Harlem to hire black workers and traveling to the south to protest segregation decades ahead of the Freedom Riders. “You could go to some Jewish working class areas in the Bronx in the 30s and 40s and it was a two-party town there: either you were socialist or communist,” said Bhaskar Sunkara, editor of Jacobin Magazine and a member of the DSA’s National Political Committee. “That’s the terrain politics operated on.” Sunkara wants to shift that terrain once more along political boundary lines drawn by class. Celeste Hornbach of the Crown Heights Tenants Union already considered herself a socialist for a number of years and had worked with the Sander’s campaign, but like Jabari Brisport, she joined after the election. DSA’s eagerness to help bolster grassroots campaigns attracted Hornbach to the group. That battle for housing in Brooklyn is centered at the moment on the Bedford Armory, a 138,000 square-foot, red-brick, castle-like structure that has stood dormant between Atlantic Avenue and Pacific Street for decades. Erected in the style of Roman revival popular in the 1890s when it was built to house the Army’s 23rd Regiment, the building was briefly home to William Randolph Hearst’s Cosmopolitan Studios in the 1920s, before Hollywood became the capital of the movie-making world. Currently it is the site of a different type of production, one all too familiar to New Yorkers in recent years, a narrative as worn out as that of any blockbuster film. If it were a film, it might be called Gentrification: The Final Reckoning, given the wide-ranging impact the $196 million development will have on surrounding Crown Heights and the precedent it could set across the five boroughs. 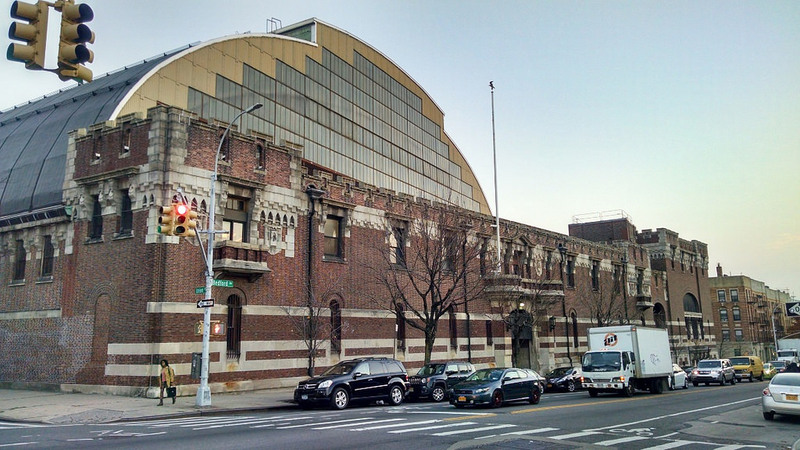 The Bedford-Union Armory, site of a mounting battle over gentrification in Brooklyn. Photo: JV Santore. The development will likely serve as a giant Crest whitening strip for the black and afro-carib neighborhood since, as a March report from Communities for Change notes, white families will be far more likely to afford housing at the Bedford Army than their black and Latino counterparts. Unable to afford the rent hikes in the surrounding area that result from the development, longtime people-of-color tenants will be displaced. Although Richardson lives two blocks from the Bedford Armory, the development isn’t technically in her district and, in any case, it is out of the state assembly’s hands. It’s future is up to the Department of City Planning which will first have to certify BFC’s land use application. Next the Crown Heights community board will make recommendations to the Borough President and Borough Board. Finally, the City Planning Commission will weigh in. After passing through this dizzying array of checkpoints that few but city bureaucrats and savvy real estate insiders know how to navigate, the development will go before the City Council. There its fate will ultimately be decided by Councilwoman Laurie Cumbo given City Council’s unwritten rule of approving developments provided they are backed by the councilmember representing the district in which they are undertaken. The District 35 representative, a Democrat, has hosted a series of town halls on the Bedford Armory development that have been packed by its opponents. Cumbo says she’s against the project as it currently stands but whereas DSA and the Crown Heights Tenants Union are calling for the Armory to become part of a community land trust, Cumbo wants to negotiate. Opponents of the project are distrustful of Cumbo’s let’s-hear-em-out approach. They do not want to negotiate for scraps. She in turn feels her views have been mischaracterized by her opponents. “I don’t see the benefit in not hearing what the deal is before we kill the deal,” Cumbo said. The conflict between pragmatic politics embodied by the Democratic politician and her critics to the left is also one that has played out within socialist movements in the past. There were the “sewer socialists” who won hundreds of municipal offices in early 20th Century in America, for instance, who urged their more radical brethren to put aside their revolutionary ideals and concentrate instead on immediate, practical concerns like building public works projects. The German revolutionary Rosa Luxemburg attempted a synthesis of the two poles, which were also present among European socialist groupings. 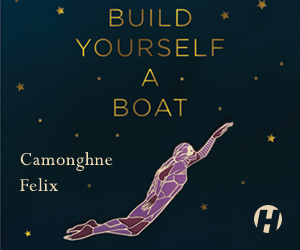 Fighting for reform is a way of building mass power capable of revolution, she contended. 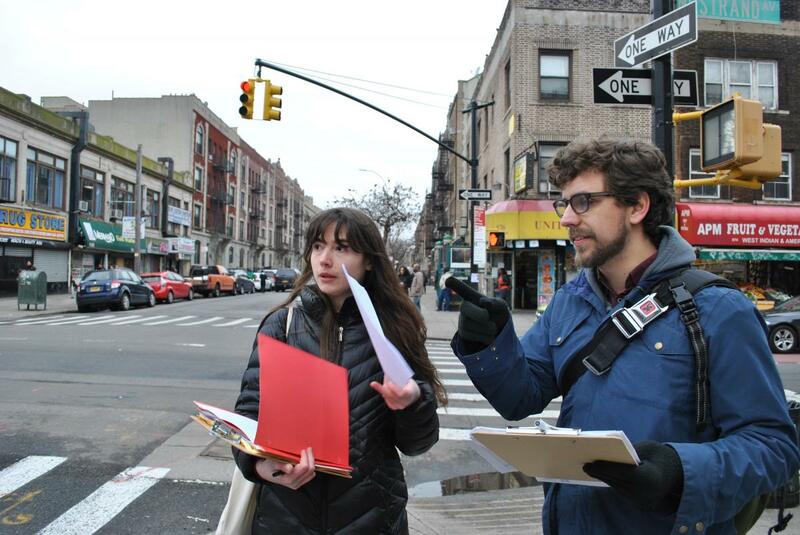 DSA organizers Jordan Leon-Atkins and Samuel Lewis canvassing on the streets of Crown Heights, Brooklyn. Photo: Peter Rugh. DSA for its part emerged in the early 1980s on the right wing of American socialism, rejecting revolution in favor of a reformist approach. “I share an immediate program with liberals in this country because the best liberalism leads toward socialism,” the late social critic and author Michael Harrington, a founding member of DSA, once put it. Largely unaccountable to the it’s rank-and-file supporters, the Democratic Party leadership has drifted toward the center-right and become highly technocratic while simultaneously de-emphasizing politics to voters. A Vox analysis of Hillary Clinton’s campaign advertisements in the 2016 presidential campaign, for instance, found that they were almost entirely free of any specific policy proposals. Bernie Sanders’ primary challenge, by contrast, ignited interest around socialist ideas like free higher education and universal health insurance — actual leftwing policies that mobilized millions of younger voters in the party. “We fight for what the left has historically fought for, which is mass, democratic organizations that can hold people accountable, where people pay dues and are actually part of the organizing, so it’s not just you receive a couple of emails telling you to donate to the DNC,” said Guastella. And he doesn’t just want to convince liberals either. In Philly, DSA members are following the same track as the their counterparts in Brooklyn, turning their organizational growth towards class struggle. Guastella and his comrades are in the midst of developing a campaign with local nurses unions to push for a single payer health care system in Pennsylvania. That might seem like an outlandish demand given the health care discussions dominating Washington, D.C. these days but it is one that attracted millions of voters to Sanders, even ones that eventually voted for Trump. DSA is vetting a new crop candidates to run at local and state levels across the country in 2017 and 2018. DSA candidates will mostly compete in Democratic primaries but the organization is open to pushing their politics independently. In Brooklyn, Jabari Brisport is running in the 35th Council district as a Green against Laurie Cumbo and another Democratic Party regular. 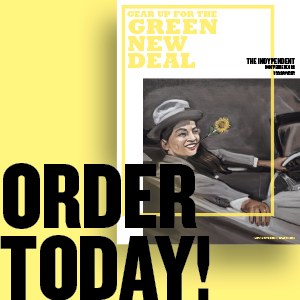 The expectation is that its grassroots activism will propel socialists into office or, at the very least, the electoral campaigns will rally voters to engage deeper with socialist politics, in the same way the Sanders campaign did. The strategy has its pitfalls, however. Sunkara thinks activists should take the long view towards socialism. He doesn’t want people to be discouraged if victories are few and far between — a likely prospect not just given who occupies the White House but because socialism seeks to turn the existing social order on its head. Still, change is fluid. “There are years that seem like decades and days that seem like years,” Sunkara said.